Duck | Gourmet from the galley! I can hear you saying… NOT ANOTHER DUCK RECIPE! I promise I’ll post something different next week. This is only my second time making risotto. The first was several years ago when I made a crayfish risotto. This may not look pretty but it is delicious! You could easily make this for two people using one duck breast… there almost seemed to be more duck than rice… but Dwayne wasn’t complaining. I was just happy it turned out as lovely as it did! Finely sliced leafy greens, spring onions and duck tossed through the rice at the end of cooking. Lightly score the duck skin a few times and rub the duck breast all over with 1 tsp of the five spice. Place skin side down in a cold non-stick pan on medium heat without oil for 7-10 minutes or until golden brown, flip and seal the other side for 30 seconds. Remove from pan but keep the oil from the duck fat. Place the duck breast skin side up on a rack in a roasting tin and put on the middle rack of a 220°C preheated oven. Cook for 15 minutes. Then take the duck from the oven and let it cool before slicing. While the duck is cooking…. Heat fat from the duck in a large pan and add the onion and garlic, and cook on medium heat for several minutes. Add the mushroom and continue to cook, stirring occasionally for a few minutes. Add the rice and continue to cook on medium heat, toasting the rice for 4 minutes. (This is an important part of making risotto). Then add the red wine, the remaining 1 1/4 tsp of five spice, and light soy sauce. Allow the red wine to be absorbed before you begin to add the stock. Add 1/4 of a cup of stock at a time… allowing each 1/4 cup of stock to be absorbed before adding more. Keep stirring the rice and testing the consistency. When the rice is almost done (you have tasted it and are happy with the consistency) add the spring onions, leafy greens and the sliced duck. Lightly toss the ingredients through as you finish cooking for a couple of minutes. Bon appetite! Like this recipe? Please share with friends, or pin using the image below… thank you! 1 long red chilli, juilianned or diced. Using a mortar and pestle, crush the spices until well ground (or use five spice powder if you prefer). Rub the spice mix all over the duck breast. Heat a frypan until hot (do not add oil). Place duck skin side down and cook for a few minutes, on moderate heat, until fat renders. Then place the duck into a preheated oven, set at 210c, for 15 minute. Remove the duck from the oven and let it rest for 10 minutes before slicing. Put all the ingredients for the dressing in a jar and give it a good shake. Refrigerate until needed. Combine all the salad ingredients and dress the salad at the time of serving. 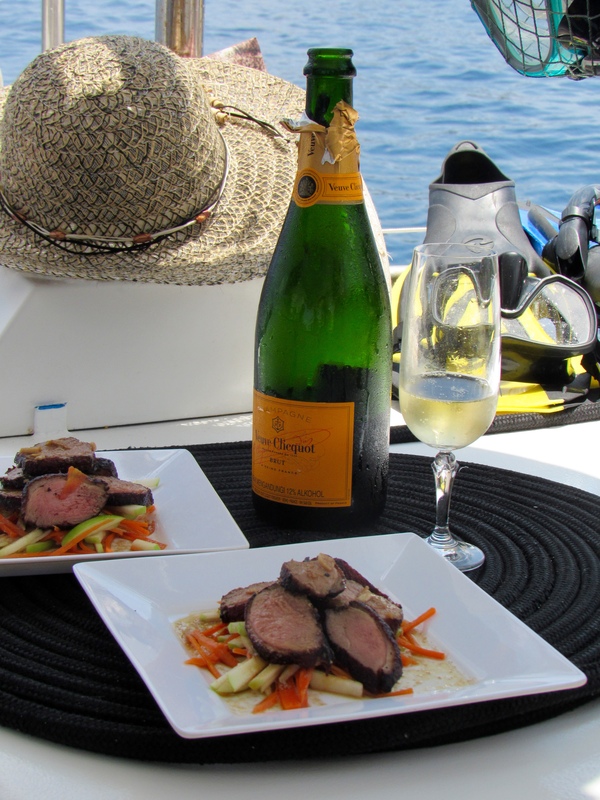 Serve the sliced duck with the mango salad for a fresh zesty treat. I cooked this crispy duck breast salad for our 12th anniversary dinner. Our anniversary dinner was a day late because we both forgot our anniversary, until the end of the day when I remembered. I, of course, played the “I was just waiting to see if you’d remember” card… but Dwayne saw through it! 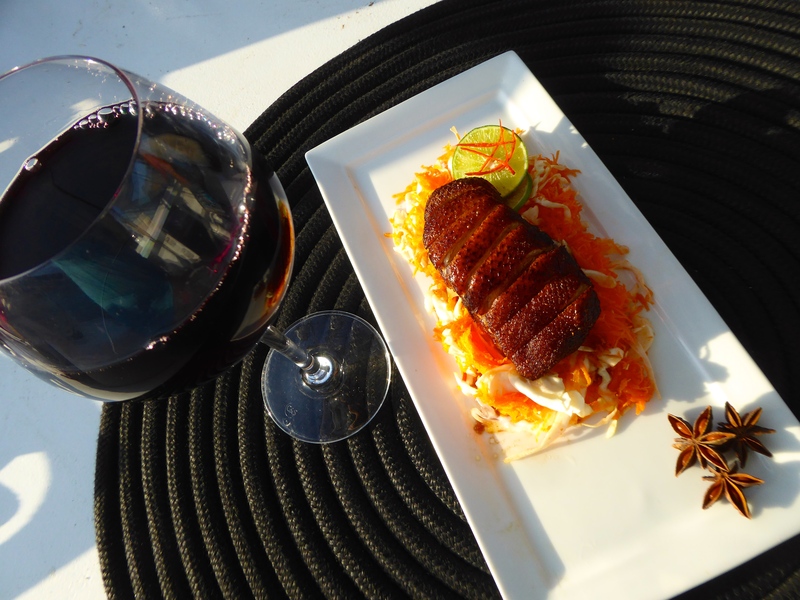 Crispy Skin Duck Salad – this one I made for Hellen and Phil for their anniversary. What I had aboard… duck breast, cabbage, carrot, chilli, star anise, cinnamon sticks, chicken stock, ginger, garlic, peppercorns and soy. I mixed all the stock ingredients together and marinated the two duck breasts for 12 hours. Then I removed the duck and put the marinade into a pot and brought it to the boil. I simmered this stock for 10 minutes before adding the duck breast. I then added the duck and simmered for a further 5 minutes. I removed the duck breasts (reserve the stock) and dried them on a paper towel and sat them before a fan to dry. In the mean time I made a salad of shredded cabbage, carrots and julienne chillies. To serve I placed the salad on plates and set them aside. I heated oil in a fry pan and fried the duck for a few minutes on the underside before turning it over and frying the duck breast, skin side down, until crispy. Once crispy, I sat the duck aside for a few minutes while I heated the reserved stock, reducing it. I sliced the duck and placed it on the salad and ladled some of the reduced master stock over the salad. The salad to go with this duck was made with apple and carrot. Sharing is caring! Pin this recipe so you’ll never lose it… Thank you! 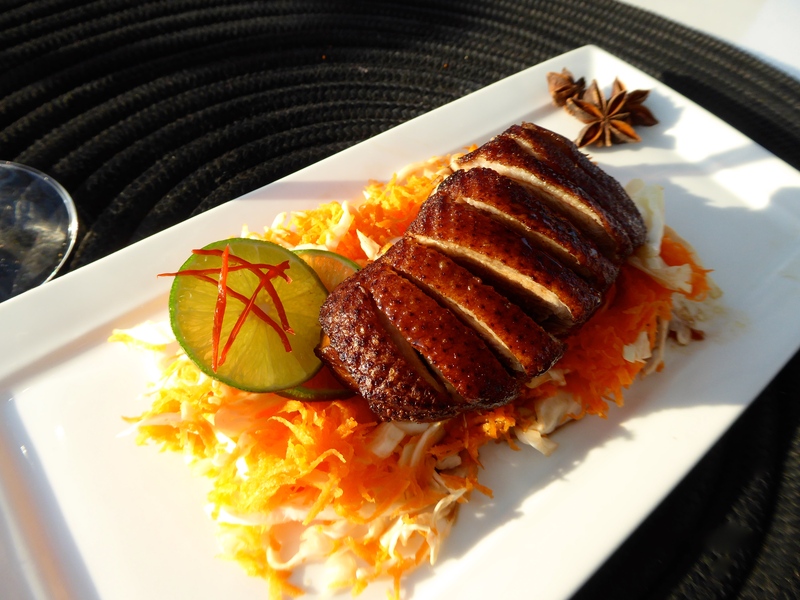 Bebek Betutu – Bahasa Indonesia Bebek is duck and Betutu is the name of the blend of spices. It is a popular ceremonial dish in Bali. On a little island just off Pulau Bawean in the Java Sea, Dwayne and I decided to cook a duck on the beach. First thing we had to do was decide how were we going to cook this duck (which would take about four hours). We tossed around ideas of cooking the duck ‘hungi’ or ‘lovo’ style (buried in the ground with hot rocks), but because we didn’t know whether the rocks on the beach would hold their heat we decided to build an ‘oven’ that would have a small fire at the bottom. Armed only with a small shovel and some ideas on what he wanted to build, Dwayne headed to the beach to build the oven while I made a betutu paste and prepared the duck. I decided to use a recipe I had seen on the SBS website, you can find the link for it at the bottom of this blog. For the betutu paste I blended shallots, garlic, candlenuts, shrimp paste, galangal, ginger, turmeric, chilli, palm sugar, black peppercorns, coriander seeds, lime juice, kaffir lime leaves in my mortar. I cleaned the duck inside and out and then rubbed some paste on the inside of the duck cavity and all over the outside. I wrapped the duck in banana leaves and put it in a tray and covered it with alfoil. The duck was ready to put in Dwayne’s oven. Meanwhile Dwayne had found a large slab of wood with a ready made chimney and used it as the back of the oven. Using a large rock on the beach as one wall he then had to build the next two walls of the oven out of rocks and sand, leaving a small opening to feed the fire at the bottom of the oven. After I put the prepared duck in to the oven we closed the top with bamboo and pandanas leaves. We had to feed the small fire at the bottom of the oven constantly as we didn’t have any first class wood to build up the coals. We wrapped a couple of potatoes in alfoil and popped them in the oven. Meanwhile I was soaking a length of bamboo in the beach water, getting prepared to cook some rice in it. All I did for the rice is add 1 cup of rice and 1 1/2 cups of fresh water to the bamboo and seal the top with alfoil. I propped the bamboo over a small fire and cooked the rice slowly, until it was miraculously cooked…. to perfection. Not everything when smoothly our oven did partially collapse once and the roof of bamboo and pandanas leaves caught alight a couple of times! But in the end the duck was fall-apart tender. Potatoes and rice were al dente`. Fantastic meal in a fantastic setting….. worth the five hours of hard work! The duck was tender and delicious! Dwayne sucking the meat from the duck’s head!